Barolo Chinato is an old specialty and a dying art of the Piedmont region and owes its name to the use of the bark from the South American cinchona (also known as Quinine) tree which is then steeped in Barolo and flavored with a variety of ingredients, depending on the producer's unique formulation. 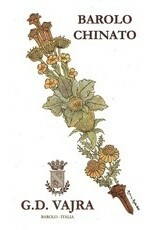 The wine used for the production of the Vajra Chinato is the current vintage of Barolo Albe DOCG. The thirty or so herbs, zests, and plant roots infused in the G.D. Vajra offering come from the Alps, which embrace Piemonte, especially those which have a proven digestive, decongestive, and relaxing effect. Cinchona Calisaya, orange zest from organic Sicilian farming, and raw sugar complete the process.